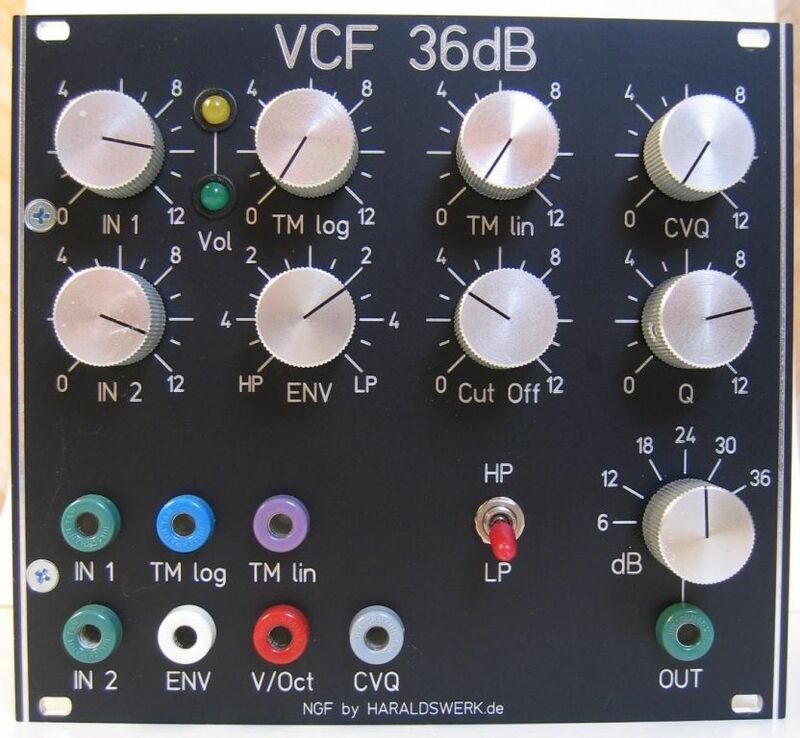 I just wanted to know how a 36dB VCF sounds like. So i build one. 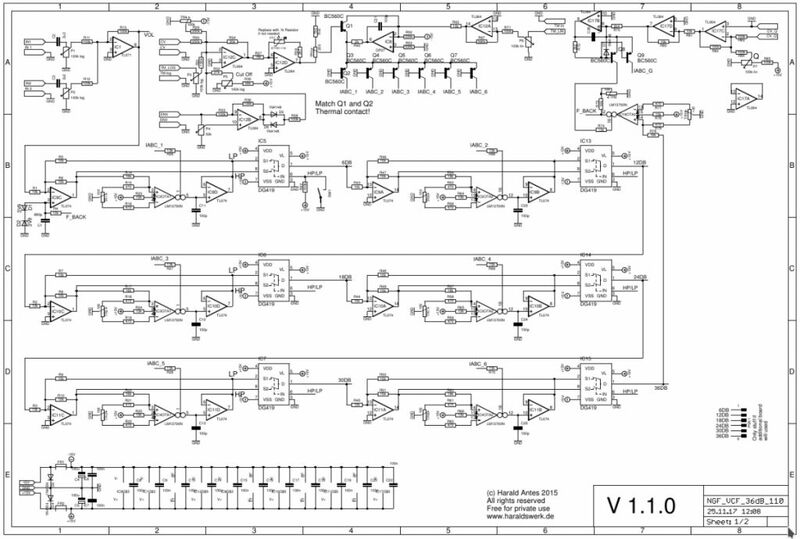 This one is basically derived from my 24dB VCF LP/HP which i build for my Next Generation Formant Elektor project. I just added two more filter stages and the compensation circuitry from my Moog Ladder filter to compensate for the volume loss when Q is turned up. I have brought out all 6 filter stage outputs. Depending on your wiring you can use a switch to select between the outputs or/and bring all outputs out in parallel. The LP/HP switching is done with electronic switches on the PCB to avoid the problems (hum, noise...) of the wiring with a mechanical switch. The documentation for download can be found in my website. Straight forward design. Six state variable filter cells are connected together in series, The output of each filter cell is brought out. There are a lot descriptions of those state variable filters out there. I feel no need to add another one. The resonance (Q) is voltage controlled with means of the OTA IC16OTA2 in the upper right corner (page 1). To compensate the volume loss when the resonance (Q) is turned up a second OTA (IC16OTA1) is used. This two OTA shares the same Iabc source. 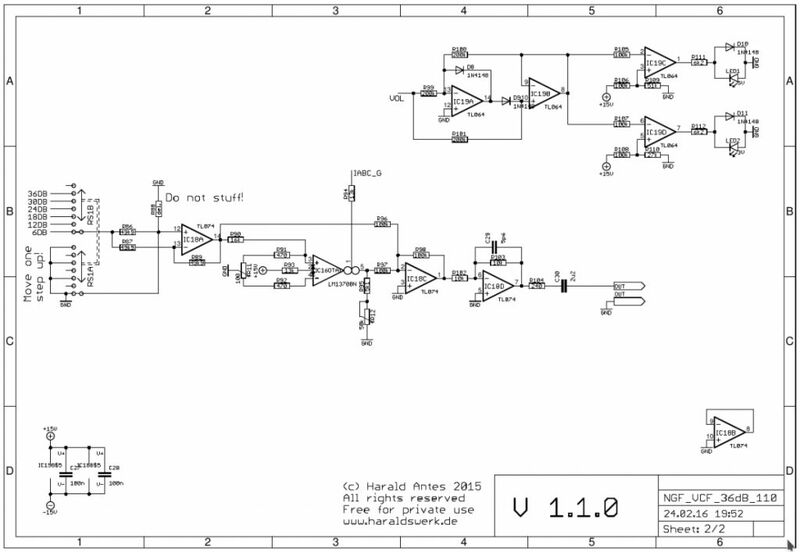 The amplification of this second OTA is increased when Q is going high and add volume to the output signal (See page 2 of the schematic). Looks interesting. Do you have any sound demos? No, sorry. I will post some sound demos here asap. Interesting panel design. 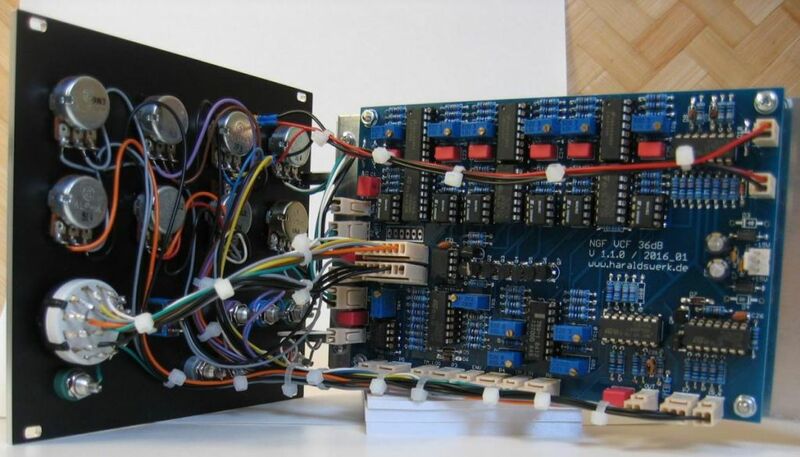 Do you make all your own modules and panels? It looks sort of like MU, but with bananas! Thanks. Yes all modules and panels are my design. 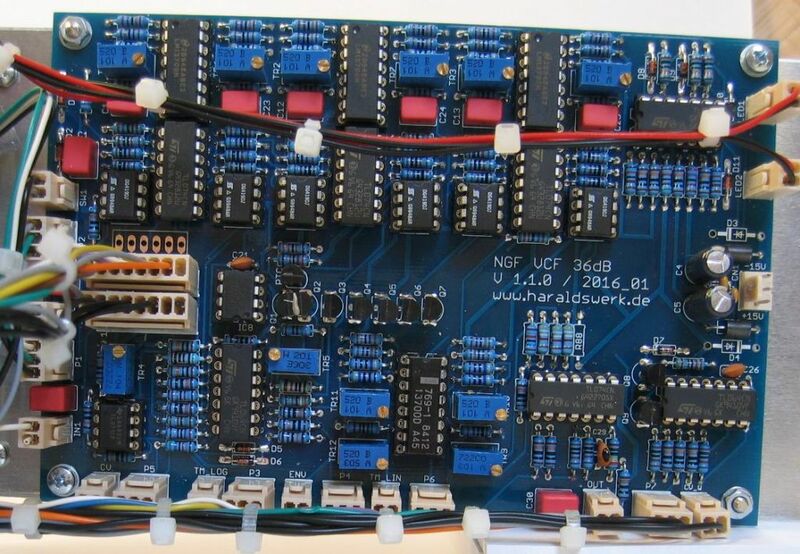 The schematics and PCB are made with Eagle and manufactured by Elecrow. The panels are done with FPD and manufactured by Schaeffer. More examples on my website. I should have looked at the links on your first post! Your work is impressive. Very clean designs and assembly. I like the use of headers on the PC boards for all panel wire connections. With all those OTAs how noisy is it? I have optimized the SNR using the linearization diodes and driving the OTA with high Iabc. I don't have the equipment to measure the SNR so the following is a bit subjective. When i turn my PA all the way up and open the filter completely with no signal attached I can here some noise. Closing the filter with the cut off potentiometer lowers the noise. So this filter add to the overall noise. But lowering the amplifikation of the PA to a level my ears can stand without doing harm to them and using the filter with signal attached the noise is not audible for me. It must be there but the signal to noise ratio is quite good. At least to my ears. Yes those connectors give you a lot of freedom for the wiring and the panel design. However I moved on to a "flat" design in some cases. No more wiring needed and the depth of the module is lower. But you need two PCB in most cases. Changing the panel design now needs changing at least one PCB as well. Interested in hearing this, 36db High Pass sounds like fun to me.